This tracing shows a baby in serious trouble. Surprised? You might be if you thought that a fetal heart rate tracing supplied the same information as intermittent ausculation (listening) with a doppler. But electronic fetal monitoring provides a wealth of information that cannot be obtained by listening, and that allows for a more comprehensive view of fetal well being. What information does this tracing provide? To understand, you need to know what we are looking at. We are looking at two different graphs created simultaneously by the fetal monitor. 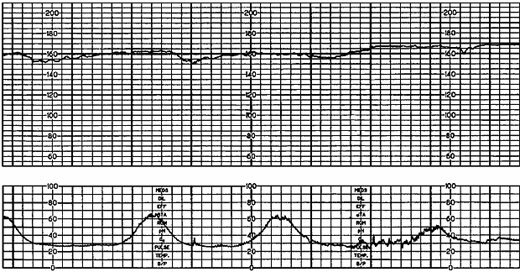 The top graph shows the fetal heart rate; the bottom graph shows the uterine contractions. The information in the top graph can only be understood in relation to the information in the bottom graph. * The baseline fetal heart rate is approximately 160 beats per minute. This is a normal fetal heart rate. Therefore, if you were listening briefly at most points during which this tracing were created, you would think that the baby was doing fine. * There is decreased variability. We know from looking at millions of tracings that the normal fetal heart rate will created a jagged line. This is known as “variability.” As the circulatory needs of the fetus change from moment to moment, the heart rate adjusts from moment to moment. When the baby’s brain is deprived of oxygen, the heart rate will lose variability, and the line will look smoother. This heart rate tracing has lost its variability; this baby is in trouble. There is no way to determine variability while listening, so intermittent auscultation would not alert you to this ominous development. * There are no accelerations. A well oxygenated baby will move from time to time. That will be reflected in temporary increases in the heart rate (accelerations) lasting for fractions of a minute or more. Without a written tracing, it is difficult to determine if there are accelerations. * There are subtle late decelerations. A deceleration is a brief decrease in heart rate. Their significance is not in how deep they are, but in where they are located in relation to the contraction. They are categorized as early (before a contraction), variable (at the peak of a contraction), or late (staring during a contraction but continuing after the contraction has ended). Late decelerations are an indication that the baby is not getting enough oxygen through the placenta to “hold its breath” during a contraction when the supply of oxygen is temporarily cut off. 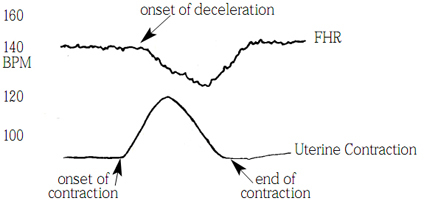 Repetitive late decelerations are an unequivocal sign of fetal distress. It is important to note that the depth of the deceleration has nothing to do with the severity of oxygen deprivation. Subtle late decelerations, such as those in the tracing at the top, are nonetheless extremely ominous. Can you hear a late deceleration with intermittent monitoring? That depends entirely on when you listen, how long you listen, and whether there are contractions during time when you are listening. The subtle late decelerations in the tracing above might be very difficult to appreciate by listening alone. That’s because the heart rate changes only by 5-10 beats per minute and only for a period of 15-20 seconds. You don’t see a bradycardia, a sustained period of abnormally low heart rate. That’s because bradycardia is often a terminal event. Most babies can tolerate long periods of significant oxygen deprivation before they die, and they may not have any bradycardias until immediately before death. On this tracing, there is never a single moment when the heart rate is outside of the normal range, but the baby is nonetheless suffering from serious oxygen deprivation. This is almost certainly what is happening in hours before a dead baby drops into a homebirth midwife’s hands. The midwife may be intermittently listening to the baby’s heart rate, but unless she is listening for long enough AND frequently enough AND exactly at the right times AND can distinguish subtle changes in heart rate, she will be blissfully unaware that a baby is dying right in front of her. Homebirth advocates and their midwives who insist that the baby’s heart rate was “fine” until just before delivery are completely wrong. The baby’s heart rate was not fine; they just couldn’t tell what was happening because they only listened intermittently. Homebirth advocates and their midwives who insist that no one could have predicted that the baby would need an expert resuscitation are completely wrong. The baby was not fine; they simply couldn’t tell one way or the other. Homebirth advocates and midwives who insist that the same thing would have happened at the hospital are completely wrong. The pattern would have been picked up, probably hours before the baby’s death, and a C-section would have been done. The baby would have been born healthy and screaming and the mother and midwife would have been fuming about the “unnecessary” C-section. Homebirth advocates and midwives who insist that intermittent monitoring is just as safe as electronic monitoring are completely wrong. If you can’t pick up subtle changes in heart rate, you can’t diagnose and treat fetal distress early, before the baby’s brain has been permanently damaged. Could you (or anyone) hear that heart rate pattern? If not, then you can understand how very easy it is to listen intermittently to a “normal” heart rate, and then unexpectedly have a dead baby drop into your hands. I lost my son after my midwives (both CNMs) ignored the cascade of complications that presented at my home birth. I demanded hospital transfer, but was met at the hospital by an OB who refused to perform a cesarean. The OB is a close colleague of the midwives I contracted with, and is herself a staunch natural birth advocate and practicing CNM. After 36 hours of laboring at home, my son and I were left to linger for another 12 more hours in hospital, until his heartbeat stopped inside me. Only then was I finally granted the c-section I had first demanded over 12 hours prior. Not only did I lose my son, but I also experienced an unmedicated c-section. PLEASE HELP– I have the fetal heart strips (90 pages total). I’m am looking for someone to have a look and indicate the areas of concern, where they notice areas of concern/ deviations from the norm. I’m not looking for a full analysis and interpretation. The heart strips are the only part of my medical record that I’m not able to interpret, and I’m very interested in getting a better understanding of them. If anyone is willing/able to help, please contact me at MorganJDunbar@gmail.com. Thank you! I have read all complete bog post i have found really good information. Heart Rate Monitor is really good device to listen unborn baby’s heart beat. A: This is fascinating, and B: What does a rupture look like? I had telemetry monitoring for my daughter’s birth. I was being induced for low amniotic fluid but wanted to go natural. I had an external contraction monitor and an internal electrode and on telemetry it picked up beautifully. They started pitocin about 9am and I walked around in the halls and the room. I was finally tired around 5pm, got in bed, had a little Demerol and Phenergan to take the edge off, dozed a bit, and had her about 8:30pm. The freedom with the telemetry was wonderful. Woah. I didn’t see the difference when looking at the images, but once you said what they were, it became SO obvious despite how subtle it is. Unbelievable that some people think they can hear that with just intermittent checking. That’s like only looking at a few seconds’ worth of the tape and ignoring the rest! The funny thing is, an epidural that relaxes the mother and enables her to breathe normally is great for ensuring the baby gets enough oxygen, and often ameliorates mild fetal distress, but the same people who oppose monitoring also oppose epidurals! Good medical professionals are happy to explain ‘why’, in my experience. I avoid those who get defensive or patronising when asked to explain ‘why’. During my first labour my baby was showing signs of distress for a long time before the nurse-midwife called my OBGYN. The nurse-midwife allegedly didn’t want to bother the OBGYN because the OBGYN was 6 months pregnant, so she delayed calling her even though my baby was in distress and had a partially abrupted placenta. I got a copy of the CTG trace after the delivery and kept it for years, and I interloaned articles on how to read a CTG trace and got my husband to study them. He kept an eye on them during my three subsequent deliveries, although fortunately none of my other three babies got distressed. I will never forget how my husband picked up the CTG trace and started reading it during my second labour, and the OBGYN (a different one, needless to say!) said ‘Are you okay with that?’ in a kind of ‘can I explain that to you?’ tone of voice. My husband said nonchalantly ‘Oh yes. Nice beat-to-beat variability, isn’t there?’. My OBGYN looked thunderstruck. He had no idea my husband had learnt to read one! This is the first time that I’ve read this post, and the first time I’ve truly understood the reasons for continuous EFM, and the first time that I’ve realized how very VERY lucky I am that my son was born healthy and whole after my HB midwives heard his heartbeat take a significant dip during the second stage of my labor… and he wasn’t actually born til an hour later, after we’d called 911, the paramedics arrived, and we transferred to the hospital. To think of how differently things could have turned out just amazes me. I can’t believe I never realized at the time what a huge gamble we were taking with our child’s life.